Background: Given the poor long-term effectiveness of focused nonsurgical knee osteoarthritis (OA) treatments, alternative therapies are needed for patients who have unsuccessfully exhausted nonsurgical options. Methods: A telephone interview was conducted in patients who participated in a single 8-week multimodal knee OA treatment program (mean follow-up: 3.7 years, range: 2.7–4.9 years). The program consisted of five intra-articular knee injections of sodium hyaluronate (Hyalgan®), with each injection given 1 week apart, structured physical therapy, knee bracing, and patient education. Clinical outcomes included knee pain severity, Western Ontario and McMaster Universities Osteoarthritis Index (WOMAC) subscores, current medication use, and history of total knee arthroplasty. Base-case, subgroup, and sensitivity analyses were conducted to determine the incremental cost-effectiveness ratio (ICER) of the treatment program with comparisons made to historical literature controls undergoing usual care. Results: A total of 218 patients (54%) provided long-term follow-up data. Knee pain severity decreased 60% and WOMAC subscores decreased 33%–42% compared to baseline (all p<0.001). Total knee arthroplasty was performed in 22.8% (81/356) of knees during follow-up. The treatment program was highly cost-effective compared to usual care with a base-case ICER of $6,000 per quality-adjusted life year (QALY). Results of subgroup analyses, one-way deterministic sensitivity analyses, and second-order probabilistic sensitivity analyses resulted in ICERs ranging from $3,996 to $10,493 per QALY. The percentage of simulations with an ICER below willingness-to-pay limits was 97.2%, 98.9%, and 99.4% for the $50,000, $100,000, and $150,000 per QALY thresholds, respectively. Conclusion: Participation in a single 8-week knee OA treatment program, which included one cycle of five intra-articular knee injections of sodium hyaluronate given at weekly intervals, is highly cost-effective and provides clinically meaningful reductions in patient symptoms that are maintained over 3.7 years mean follow-up. Osteoarthritis (OA) of the knee is a major cause of disability that affects 12% of adults aged ≥60 years.1 Knee OA is responsible for progressive joint pain and dysfunction due to articular cartilage and subchondral bone damage, synovitis, and osteophyte formation.2 Conservative measures such as analgesics, aerobic training, and muscle strengthening are initially employed to alleviate symptoms and maintain joint function. In the estimated 3.6 million knee OA patients who have unsuccessfully exhausted nonsurgical treatment options in the United States,3 surgical options such as total knee arthroplasty (TKA) or unicompartmental knee arthroplasty may be indicated. Ideally, alternative nonsurgical options that could decrease knee pain, restore joint function, and potentially delay the need for arthroplasty would be available to patients who have unsuccessfully attempted focused conservative therapies. Intra-articular injection of hyaluronic acid (HA), or viscosupplementation, is an efficacious nonsurgical therapy for treatment of knee OA.4 Recent meta-analyses have confirmed the efficacy of viscosupplementation for knee OA over 6 months follow-up.5–7 Accumulating evidence suggests that the clinical benefit of HA is underestimated using conventional meta-analytic techniques given disparities in control group effect sizes.8,9 Intra-articular injection of exogenous HA replaces OA-induced reductions in the concentration and molecular weight of endogenous HA, thereby alleviating patient symptoms through postulated mechanisms including inhibition of chondrodegradative enzymes and inflammatory processes, stimulation of chondrocyte metabolism, and synthesis of articular cartilage matrix components.10,11 As chronic joint overload is a major risk factor for knee OA development,12–14 treatment programs centered around viscosupplementation, but with concomitant utilization of joint-unloading therapies, may potentially yield synergistic benefits. Given that the typical patient endures knee OA symptoms for 9–12 years before electing to undergo arthroplasty,15–17 long-term data would be mandatory with such a therapy to answer important questions related to potential for delayed TKA and cost utility. We previously reported outcomes in patients who participated in an 8-week real-world multimodal knee OA treatment program consisting of viscosupplementation, structured physical therapy, knee bracing, and patient education. At completion of the program, patients reported a 59% mean reduction in knee pain and 44%–51% improvements in mean Western Ontario and McMaster Universities Osteoarthritis Index (WOMAC) subscores.18 In a follow-up study in these patients, knee symptom alleviation was maintained through 2 years and the program was deemed highly cost-effective.19 In the current study, we report long-term clinical outcomes and cost utility in a subgroup of these patients who were treated with Hyalgan® (Fidia Pharma USA Inc., Parsippany, NJ, USA), a 500–730 kilodalton sodium hyaluronate. We contacted patients who previously participated in a single 8-week multimodal treatment program for symptomatic knee OA.18,19 Eligible patients were adults with symptomatic knee OA who met the clinical criteria for medical necessity regarding HA therapies set forth by Medicare Local Coverage Determinations, which typically included a) knee pain interfering with functional activities, b) radiographic evidence of knee joint osteophytes, sclerotic changes, or joint space narrowing, c) morning stiffness <30 minutes duration, or crepitus with knee motion, and d) lack of functional improvement following >3 months conservative therapy, or inability to tolerate nonsteroidal anti-inflammatory drugs (NSAIDs). Patients were enrolled at 27 OsteoArthritis Centers of AmericaSM treatment centers in six states in the United States. This research received approval by an Institutional Review Board (IntegReview, Austin, TX, USA). IRB approval and patient consent were obtained for data collection efforts through 8 weeks follow-up. For long-term data collection, IRB approval was granted and the requirement for written informed consent was waived given that data were obtained through telephone interviews. At each treatment center, baseline assessments included a clinical and orthopedic examination. Knee OA disease severity was classified using the Kellgren–Lawrence (K-L) grading scale from standing weight-bearing X-rays where grade 0=no radiographic features of OA, grade 1=doubtful joint space narrowing and possible osteophytic lipping, grade 2=definite osteophytes and possible joint space narrowing on anteroposterior weight-bearing radiograph, grade 3=multiple osteophytes, definite joint space narrowing, sclerosis, and possible bony deformity, and grade 4=large osteophytes, marked joint space narrowing, severe sclerosis, and definite bony deformity.20 Knee arthrography was performed to identify potential contraindications to program participation (e.g., symptomatic meniscal tear, significant ligamentous instability), to ensure that no large osteophytes were present that could interfere with tricompartmental HA distribution and to ensure joint capsule structural integrity at the injection site. The 8-week multimodal knee OA treatment program has been described in detail elsewhere.18 Patients in the current series received five intra-articular knee injections of sodium hyaluronate, with each injection given 1 week apart. Injections were administered under fluoroscopic guidance, which allows for confirmation of tricompartmental HA distribution and improves injection accuracy, resulting in improved patient outcomes vs. anatomical injection guidance.21–23 Patients participated in structured physical therapy and education programs provided by physical therapists 2–3 times per week during the 8-week period. Unloader knee braces were prescribed when clinically indicated. At program discharge, patients were encouraged to continue participation in regular low-impact aerobic activity and functional exercises at home. Patients who participated in multiple 8-week treatment courses were not eligible for this study. Follow-up data through 2 years were available to the authors as previously reported.19 Long-term patient data (mean 3.7 years) were obtained through a structured phone interview. Interviewers participated in pilot testing to refine the telephone-based questionnaire and were trained to ensure a consistent structure among interviewers and study sites. Telephone interviews took ~15 minutes and were conducted between October 2016 and November 2016. Knee pain severity was assessed on a 0–10 Numeric Pain Rating Scale (NPRS) with higher values representing greater pain severity. The WOMAC version 3.1 was administered to assess knee OA-related pain, function, and stiffness.24 All WOMAC scores were converted to a 0–100 scale, with a higher score indicating a worse outcome. We defined responders as patients with ≥30% improvement in NPRS and ≥20% improvement in WOMAC Pain and Function subscales.25 Current medication use for knee OA symptoms and history of TKA were also elicited. Utility scores were derived from the EQ-5D questionnaire, which is composed of five dimensions including mobility, self-care, usual activities, pain/discomfort, and anxiety/depression.26 Utility scores at baseline and 8 weeks were derived from WOMAC scores using multiple regression;27 utility scores were derived from the EQ-5D during follow-up. The area under the EQ-5D curve was calculated for each patient to account for serial measurements.28 Effectiveness was reported as the number of quality-adjusted life years (QALYs) gained, which was calculated as the change in utility score during follow-up multiplied by the duration of follow-up. One QALY represents 1 year in perfect health, a score of 0 QALYs represents either death or 1 year in a coma, and negative values may be used to represent severe conditions such as confinement to a bed or inability to perform daily activities.29,30 Incremental effectiveness was defined as the number of QALYs gained from the knee OA treatment program minus the number of QALYs gained with usual care. The standpoint taken for the economic analysis was from a single payer perspective. In accordance with the Centers for Medicare and Medicaid Services reimbursement fee schedules, we assumed a cost of $3,300 per knee treated in the 8-week multimodal program and $25,600 per knee that underwent TKA during follow-up. Total costs for patients undergoing the knee OA program were calculated as $3,300 per treated knee plus $25,600 per TKA during follow-up. Costs for patients undergoing usual care were calculated as $25,600 per TKA during follow-up. Incremental cost was defined as the average cost for patients in the knee OA treatment program minus the average cost for patients treated with usual care. The incremental cost-effectiveness ratio (ICER) was calculated as incremental cost divided by incremental effectiveness. Assessment of the ICER in relation to an established willingness-to-pay value can be used to determine whether a proposed new treatment is acceptably cost-effective compared to an existing treatment. Baseline data were reported as mean and standard deviation for continuous variables or frequencies and percentages for categorical variables. In patients with bilateral disease, the knee with the greatest pain severity was selected for analysis of NPRS and WOMAC data. Baseline characteristics of patients who participated in the telephone interview vs. those who did not participate were compared with independent samples t-test and Fisher’s exact test. Longitudinal changes in clinical outcomes were assessed with repeated measures analysis of variance. Univariate logistic regression was used to identify factors that predicted TKA. A p-value <0.05 was considered as statistically significant. Statistical analyses were performed using Predictive Analytics Software (v. 22; IBM, Inc., Armonk, NY, USA). For the cost-effectiveness model, the base-case analysis considered patients who participated in the 8-week knee OA program relative to a hypothetical control group that did not participate in the program but utilized usual care, had identical TKA rates, and had no change or worsening in WOMAC.31 Subgroup analyses were performed to determine the impact of baseline characteristics on cost utility outcomes. One-way deterministic sensitivity analyses were performed to estimate the ICER under various conservative scenarios. We assumed that with usual care, the WOMAC score improved between 1% and 20% (pessimistic scenario).31 One-way sensitivity analysis was also performed for TKA utilization where the upper and lower limits for the usual care group were determined by assuming ±25% relative risk from the point estimate. Second-order probabilistic sensitivity analyses were performed using Monte Carlo simulations. We randomly sampled from these distributions in Monte Carlo simulations to generate 1,000 joint distribution samples of the two varying parameters (incremental effectiveness and TKA utilization). Using the Monte Carlo simulations, the distribution of cost-effectiveness acceptability was assessed in relation to ICERs of $50,000, $100,000, and $150,000 per QALY, which are established benchmark thresholds for cost-utility analyses in the United States.32 Monte Carlo simulations were performed using RiskAmp Professional (v. 4.9, Structured Data, LLC, San Francisco, CA, USA). Of the 402 patients who we attempted to contact, 158 patients could not be reached, 20 patients were contacted but refused to participate, and six patients had died. A total of 218 patients were contacted and provided long-term follow-up data (mean: 3.7 years, range: 2.7–4.9 years) for this study. Notes: Data reported as mean ± SD or % (n/N). *Scores normalized to 0–100 scale. Abbreviations: K-L, Kellgren–Lawrence; WOMAC, Western Ontario and McMaster Universities Osteoarthritis Index. Patients enrolled in this study comprised a subset of patients in whom 8-week treatment program data were previously reported.18 Over the 8-week treatment period, knee pain NPRS decreased 66%, from 5.5±2.8 to 1.9±2.2 (p<0.001). At final follow-up, NPRS scores remained 60% below baseline and 75% of patients were considered NPRS responders (Figure 1). 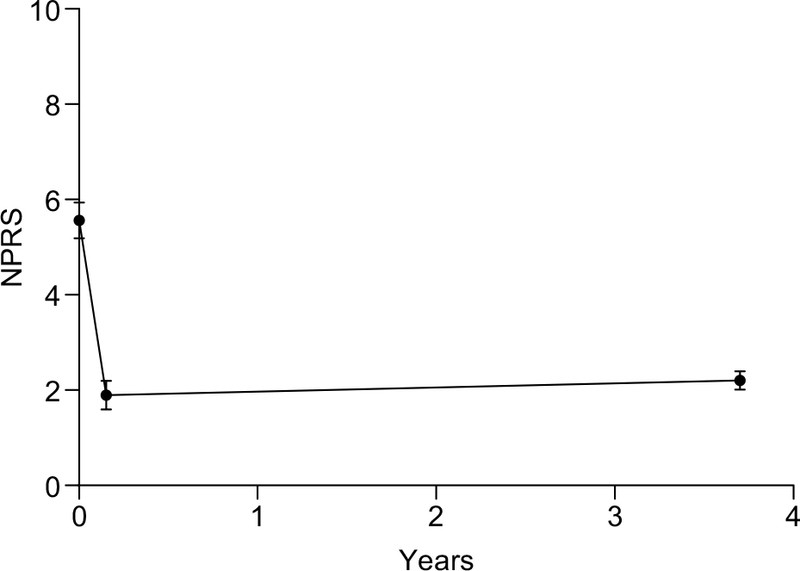 Figure 1 Change in NPRS values during 8-week knee osteoarthritis program and through 3.7 years mean follow-up. Notes: Values are mean and 95% CI. Values at final follow-up significantly lower (p<0.001) relative to baseline. Abbreviations: CI, confidence interval; NPRS, Numeric Pain Rating Scale. All WOMAC subscores decreased 43%–49% (all p<0.001) during the 8-week treatment period. 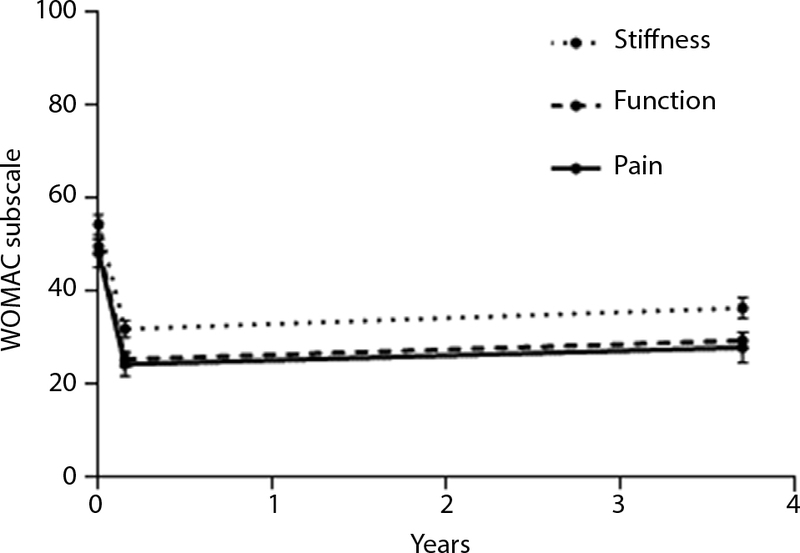 The clinical benefit associated with the multimodal knee OA treatment program was largely maintained over long-term follow-up. Compared to baseline, WOMAC subscale values remained 42% lower for Pain, 41% lower for Function, and 33% lower for Stiffness (all p<0.001; Figure 2). The percentage of long-term responders, defined as at least 20% improvement relative to baseline, was 69% for WOMAC Pain and 71% for WOMAC Function. Figure 2 Change in WOMAC subscale values during 8-week knee osteoarthritis program and through 3.7 years mean follow-up. Abbreviations: CI, confidence interval; WOMAC, Western Ontario and McMaster Universities Osteoarthritis Index. Routine medication use to alleviate knee OA symptoms was reported by 54.0% of patients, with NSAIDs (48.7%), opioids (8.1%), and cyclooxygenase 2 inhibitors (3.5%) most commonly reported. TKA was performed in 22.8% (81/356) of knees during follow-up. No baseline patient characteristic had a statistically significant association with TKA risk although younger patients and those with greater radiographic disease severity had a tendency for elevated TKA risk (Table 2). Note: *K-L class=0–2, 3, or 4. Abbreviations: CI, confidence interval; K-L, Kellgren–Lawrence; NPRS, Numeric Pain Rating Scale; WOMAC, Western Ontario and McMaster Universities Osteoarthritis Index. We performed a sensitivity analysis where patients who underwent TKA were considered failures for NPRS and WOMAC. For these patients, we utilized a baseline-observation-carried-forward approach where the value at final follow-up was imputed with the baseline value. Even in this analysis, NPRS (5.6±2.8 vs. 3.2±2.4), WOMAC Pain (48±20 vs. 31±22), WOMAC Function (50±20 vs. 33±21), and WOMAC Stiffness (54±24 vs. 39±26) values at long-term follow-up remained significantly lower than baseline (all p<0.001). Therefore, the conclusion that a single 8-week multimodal knee OA program yields long-term symptom relief is unchanged in this worst-case analysis. At long-term follow-up, EQ-5D utility scores remained significantly higher than baseline values, with an incremental increase of 0.162 (95% confidence interval [CI]: 0.146–0.177; Figure 3). Results of the base-case cost analysis are shown in Table 3. The multimodal knee OA treatment program was highly cost-effective with an ICER of $6,000 per QALY. 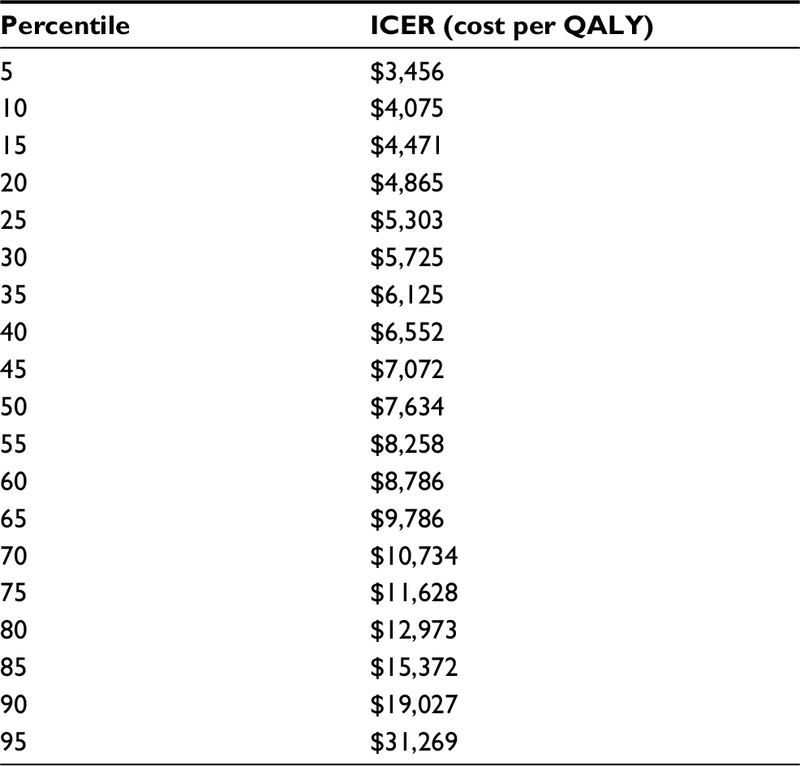 Results of one-way deterministic sensitivity analysis showed an ICER range of $6,000–$10,493 per QALY when utility score change varied and an ICER range of $3,996–$8,004 per QALY when TKA rate varied (Table 4). Subgroup analyses showed no significant differences in ICER by gender, age, body mass index, number of treated knees, or K-L grade. ICER was significantly higher in patients with greater knee pain severity at baseline (p=0.03). 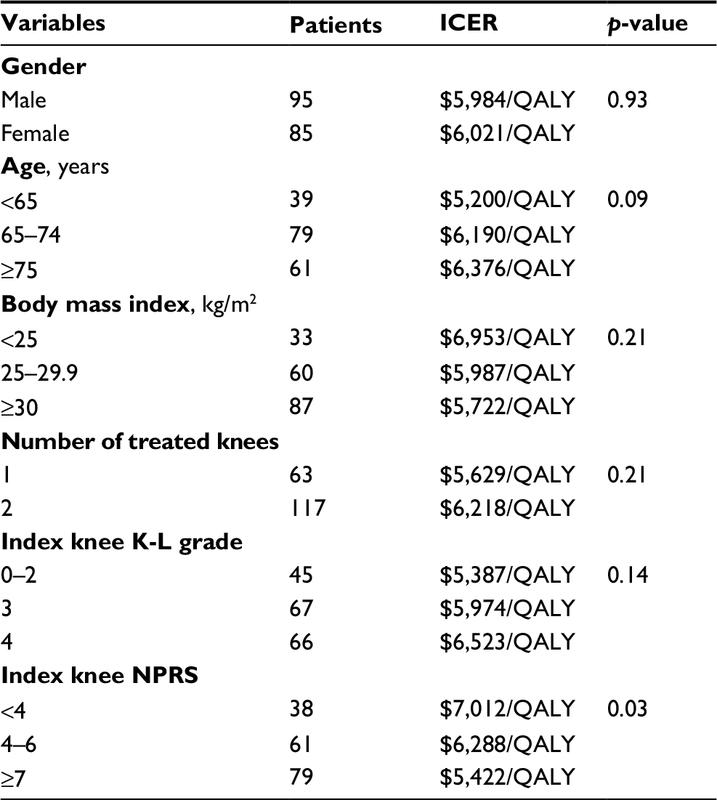 Regardless, the knee OA treatment program was highly cost-effective in all subgroups with ICERs ranging from $5,200 per QALY (age <65 years) to $7,012 per QALY (baseline NPRS <4) (Table 5). Further, routine pain medication use during follow-up did not influence these results (ICER=$6,191 per QALY in users and $5,789 per QALY in nonusers, p=0.38). Results of a second-order probabilistic sensitivity analysis with conservative assumptions identified a median ICER of $7,634 per QALY (95% CI: $2,992–$53,876 per QALY). The percentile distribution from the Monte Carlo simulations is shown in Table 6. The percentage of simulations with an ICER below common willingness-to-pay limits was 97.2%, 98.9%, and 99.4% for the $50,000, $100,000, and $150,000 per QALY thresholds (Figure 4). 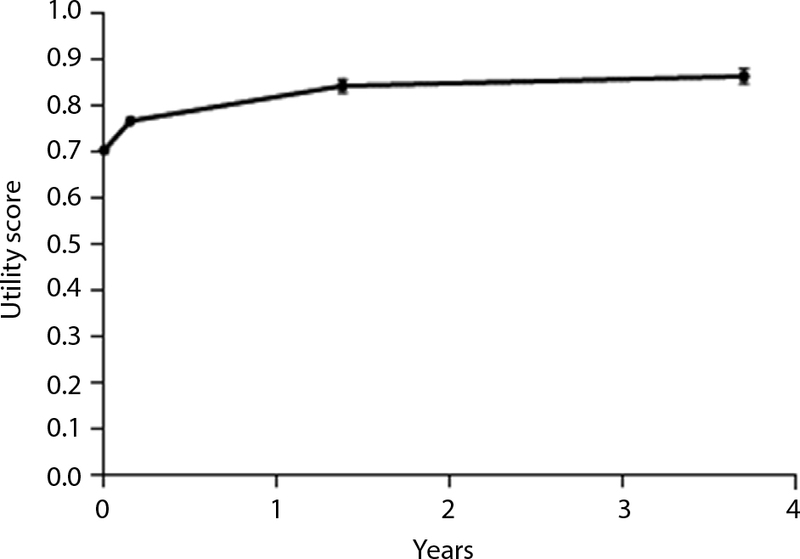 Figure 3 Change in utility scores during 8-week knee osteoarthritis program and through 3.7 years mean follow-up. Notes: Values are mean and 95% CI. Values at final follow-up significantly higher (p<0.001) relative to baseline. Abbreviations: ICER, incremental cost-effectiveness ratio; OA, osteoarthritis; QALY, quality-adjusted life year. Abbreviations: ICER, incremental cost-effectiveness ratio; QALY, quality-adjusted life year; TKA, total knee arthroplasty; WOMAC, Western Ontario and McMaster Universities Osteoarthritis Index. Abbreviations: ICER, incremental cost-effectiveness ratio; K-L, Kellgren–Lawrence; NPRS, Numeric Pain Rating Scale; QALY, quality-adjusted life year. Notes: Results of 1,000 simulations where utility scores and risk of total knee replacement were modeled as random processes across realistic distributions. Abbreviations: ICER, incremental cost-effectiveness ratio; QALY, quality-adjusted life year. Figure 4 Second-order probabilistic sensitivity analysis distribution of the cost-effectiveness of a multimodal knee osteoarthritis program relative to usual care. Notes: Results of 1,000 simulations where utility scores and risk of total knee replacement were modeled as random processes across realistic distributions. The percentage of values that were less than $50,000/QALY, $100,000/QALY, and $150,000/QALY were 97.2%, 98.9%, and 99.4%, respectively. In patients with knee OA who unsuccessfully exhausted focused conservative therapy, participation in a single 8-week program involving one cycle of five intra-articular knee injections of sodium hyaluronate given at weekly intervals, structured physical therapy, knee bracing, and patient education provides clinically meaningful reductions in knee OA symptoms that are maintained over 3.7 years mean follow-up. Furthermore, this multimodal program was found to be highly cost-effective over the long term. Durable clinical benefit and cost-effectiveness were realized in all subgroups analyzed by gender, age, body mass index, knee pain severity, K-L grade, and number of treated knees. Finally, all reported outcomes were robust to even the most conservative sensitivity analysis assumptions. The economic burden of knee OA is projected to increase by almost 50% by 2025, in large part from increasing TKA utilization.3 The number of knee replacement procedures will exceed 3 million annually in the United States by 2030,39 with the majority of procedures expected to be performed in patients younger than 65 years.40 As TKRs continue to be performed on a younger population, the number of revision procedures, which cost twice that of primary TKA, will continue to increase.39 In the current economic climate with heightened scrutiny on health care resource utilization and establishment of pay-for-performance initiatives, the ideal therapy for the patient with knee OA would be well accepted by patients, durably provide clinically meaningful improvements in pain and function, delay the need for TKA, and yield an ICER below that of typical willingness-to-pay thresholds. Before participation in the multimodal knee OA treatment program, all patients in the current study reported lack of functional improvement following >3 months conservative therapy. Therefore, the study sample had entered into the “knee OA treatment gap”,3 which represents a protracted period between conservative care failure and TKA in which the patient experiences debilitating pain, reduced quality of life, and significant financial burden. In most patients, this period will persist for life because only 9%–33% of patients are willing to undergo arthroplasty.41–43 The economic burden of the treatment gap in knee OA is projected to reach 24 billion dollars by 2025.3,44,45 Nonsurgical multimodal knee OA programs such as that reported in this study, which included once-weekly sodium hyaluronate intra-articular injections for 5 weeks, may represent a viable therapeutic strategy to address the treatment gap in knee OA. A novel aspect of this study was that clinical benefit and cost-effectiveness of this 8-week program administered in real-world settings were maintained over a mean 3.7-year period. Approximately 70% of patients continued to meet the criteria for a WOMAC responder, and the program was highly cost-effective with an ICER of $6,000 per QALY in the base case and $7,634 per QALY in a Monte Carlo simulation with conservative parameters. To the authors’ knowledge, this is one of the longest follow-up periods of any study of a nonsurgical knee OA therapy. Another notable finding of this study was that only 22.8% of treated knees underwent TKA during follow-up (annualized TKA rate=6.2%). For comparison, other knee OA studies with minimum 2-year follow-up report annualized TKA rates of 8.1%–16.7%.46–49 Although the TKA rates in this study are considerably lower than other studies, we cannot directly infer that participation in this program reduces the need for TKA. Randomized controlled trials with extended follow-up to assess health care utilization, including arthroplasty utilization, are required to draw firm conclusions on this topic. As payers expect medical interventions to not only be safe and effective, but also to provide sufficient value, there is an increasing focus on how these interventions perform not only in clinical trials, but in real-world settings. Real-world evidence from pragmatic studies is arguably more generalizable to the target patient population in comparison to clinical trials with stringent study entry criteria. Results from our base-case, sensitivity, and subgroup analyses suggest that, regardless of the assumptions made or the subgroup under study, the multimodal knee OA program was cost-effective in every scenario with a range of ICERs between $3,996 and $10,493 per QALY. Given that this pragmatic research was performed in a real-world patient sample at 27 knee OA clinics across the United States within the context of usual care, the results reported here are directly translatable to clinical practice. The primary strengths of this study were long-term follow-up in patients recruited from real-world knee OA practices across the United States, which confers excellent generalizability of these findings to the knee OA population. There were also several limitations that warrant discussion. First, there was no contemporaneous control group with which to compare results. We addressed this limitation by performing a number of sensitivity analyses that made optimistic, realistic, and pessimistic assumptions regarding outcomes in a hypothetical control group undergoing usual care. Still, the limitations and risks of bias inherent in case series remain, given the absence of a contemporaneous control group. Second, only 54% of patients who we tried to contact were able to provide data for this study. While it is possible that data were not missing at random, there were no statistically significant differences in baseline patient characteristics comparing participants to nonparticipants. Finally, due to the nature of the study design that was largely dependent on patient recall, the only costs that were considered in this analysis were those related to the 8-week treatment program and to TKA. While the cost of TKA is the largest contributor to the economic burden of knee OA,50 the omission of additional cost drivers such as physician visits and imaging studies remains a limitation of the study. Participation in a single 8-week knee OA treatment program, which included one cycle of five intra-articular knee injections of sodium hyaluronate given at weekly intervals, is highly cost-effective and provides clinically meaningful reductions in patient symptoms that are maintained over 3.7 years mean follow-up. This work was supported by Fidia Pharma USA Inc. (Parsippany, NJ, USA). LEM, MS, and SN conceived and designed the experiments; LEM analyzed the data and wrote the first draft of the manuscript; MS, TEG, JGJ, KDV, and SN critically revised the manuscript; all authors interpreted the data, reviewed and approved of the manuscript version to be published, and agree to be accountable for all aspects of the work in ensuring that questions related to the accuracy or integrity of any part of the work are appropriately investigated and resolved. SN is an employee of Fidia Pharma USA Inc. The authors report no conflicts of interest in this work. 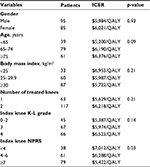 Dillon CF, Rasch EK, Gu Q, Hirsch R. Prevalence of knee osteoarthritis in the United States: arthritis data from the Third National Health and Nutrition Examination Survey 1991–1994. J Rheumatol. 2006;33(11):2271–2279. Dieppe PA, Lohmander LS. Pathogenesis and management of pain in osteoarthritis. Lancet. 2005;365(9463):965–973. London NJ, Miller LE, Block JE. Clinical and economic consequences of the treatment gap in knee osteoarthritis management. Med Hypotheses. 2011;76(6):887–892. Rutjes AW, Juni P, da Costa BR, Trelle S, Nuesch E, Reichenbach S. Viscosupplementation for osteoarthritis of the knee: a systematic review and meta-analysis. Ann Intern Med. 2012;157(3):180–191. Bannuru RR, Natov NS, Dasi UR, Schmid CH, McAlindon TE. Therapeutic trajectory following intra-articular hyaluronic acid injection in knee osteoarthritis – meta-analysis. Osteoarthritis Cartilage. 2011;19(6):611–619. Bannuru RR, Natov NS, Obadan IE, Price LL, Schmid CH, McAlindon TE. Therapeutic trajectory of hyaluronic acid vs. corticosteroids in the treatment of knee osteoarthritis: a systematic review and meta-analysis. Arthritis Rheum. 2009;61(12):1704–1711. Bannuru RR, McAlindon TE, Sullivan MC, Wong JB, Kent DM, Schmid CH. Effectiveness and implications of alternative placebo treatments: a systematic review and network meta-analysis of osteoarthritis trials. Ann Intern Med. 2015;163(5):365–372. Miller LE, Altman RD, McIntyre LF. Unraveling the confusion behind hyaluronic acid efficacy in the treatment of symptomatic knee osteoarthritis. J Pain Res. 2016;9:421–423. Dahl LB, Dahl IM, Engstrom-Laurent A, Granath K. Concentration and molecular weight of sodium hyaluronate in synovial fluid from patients with rheumatoid arthritis and other arthropathies. Ann Rheum Dis. 1985;44(12):817–822. Goldberg VM, Buckwalter JA. Hyaluronans in the treatment of osteoarthritis of the knee: evidence for disease-modifying activity. Osteoarthritis Cartilage. 2005;13(3):216–224. Waller C, Hayes D, Block JE, London NJ. Unload it: the key to the treatment of knee osteoarthritis. Knee Surg Sports Traumatol Arthrosc. 2011;19(11):1823–1829. Arendt EA, Miller LE, Block JE. Early knee osteoarthritis management should first address mechanical joint overload. Orthop Rev (Pavia). 2014;6(1):5188. Crawford DC, Miller LE, Block JE. Conservative management of symptomatic knee osteoarthritis: a flawed strategy? Orthop Rev (Pavia). 2013;5(1):e2. Bachmeier CJ, March LM, Cross MJ, et al. A comparison of outcomes in osteoarthritis patients undergoing total hip and knee replacement surgery. Osteoarthritis Cartilage. 2001;9(2):137–146. Desmeules F, Dionne CE, Belzile E, Bourbonnais R, Fremont P. Waiting for total knee replacement surgery: factors associated with pain, stiffness, function and quality of life. BMC Musculoskelet Disord. 2009;10:52. Kauppila AM, Kyllonen E, Mikkonen P, et al. Disability in end-stage knee osteoarthritis. Disabil Rehabil. 2009;31(5):370–380. Miller LE, Block JE. An 8-week multimodal treatment program improves symptoms of knee osteoarthritis: a real-world multicenter experience. Pragmatic Obs Res. 2013;4:39–44. Miller LE, Block JE. An 8-week knee osteoarthritis treatment program of hyaluronic acid injection, deliberate physical rehabilitation, and patient education is cost effective at 2 years follow-up: the OsteoArthritis centers of America(SM) experience. Clin Med Insights Arthritis Musculoskelet Disord. 2014;7:49–55. Kellgren JH, Lawrence JS. Radiological assessment of osteo-arthrosis. Ann Rheum Dis. 1957;16(4):494–502. Berkoff DJ, Miller LE, Block JE. Clinical utility of ultrasound guidance for intra-articular knee injections: a review. Clin Interv Aging. 2012;7:89–95. Jackson DW, Evans NA, Thomas BM. Accuracy of needle placement into the intra-articular space of the knee. J Bone Joint Surg Am. 2002;84-A(9):1522–1527. Daley EL, Bajaj S, Bisson LJ, Cole BJ. Improving injection accuracy of the elbow, knee, and shoulder: does injection site and imaging make a difference? A systematic review. Am J Sports Med. 2011;39(3):656–662. Bellamy N, Buchanan WW, Goldsmith CH, Campbell J, Stitt LW. Validation study of WOMAC: a health status instrument for measuring clinically important patient relevant outcomes to antirheumatic drug therapy in patients with osteoarthritis of the hip or knee. J Rheumatol. 1988;15:1833–1840. Barr S, Bellamy N, Buchanan WW, et al. A comparative study of signal vs. aggregate methods of outcome measurement based on the WOMAC Osteoarthritis Index. Western Ontario and McMaster Universities Osteoarthritis Index. J Rheumatol. 1994;21(11):2106–2112. Rabin R, de Charro F. EQ-5D: a measure of health status from the EuroQol Group. Ann Med. 2001;33(5):337–343. Xie F, Pullenayegum EM, Li SC, Hopkins R, Thumboo J, Lo NN. Use of a disease-specific instrument in economic evaluations: mapping WOMAC onto the EQ-5D utility index. Value Health. 2010;13(8):873–878. Matthews JN, Altman DG, Campbell MJ, Royston P. Analysis of serial measurements in medical research. BMJ. 1990;300(6719):230–235. Phillips C. What is a QALY? What is ...? series. 2009. Available from: http://www.whatisseries.co.uk/whatis/pdfs/What_is_a_QALY.pdf. Accessed January 9, 2017. Greener M, Guest J. The models used for health economic analysis. Hospital Pharmacist. 2006;13:45–47. Barton GR, Sach TH, Avery AJ, Doherty M, Jenkinson C, Muir KR. Comparing the performance of the EQ-5D and SF-6D when measuring the benefits of alleviating knee pain. Cost Effectiveness Resource Allocation. 2009;7:12. Neumann PJ, Cohen JT, Weinstein MC. 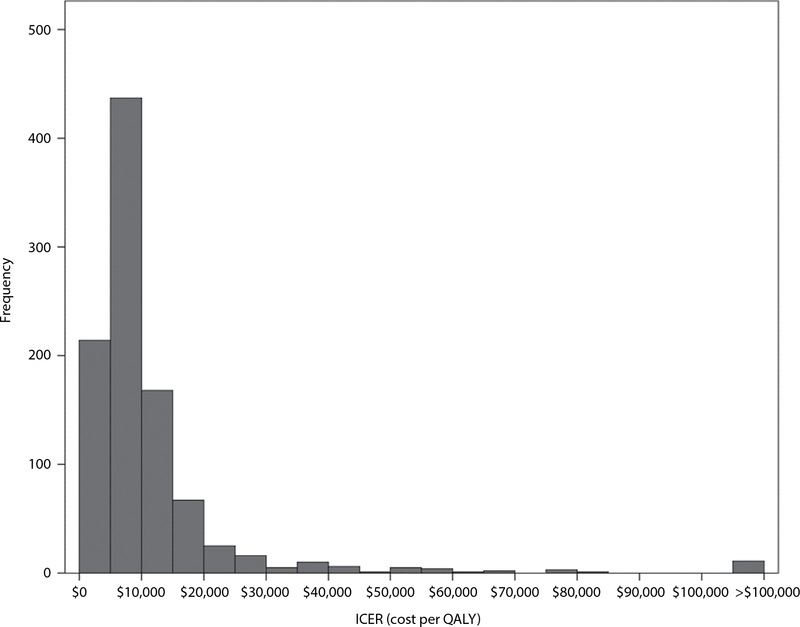 Updating cost-effectiveness – the curious resilience of the $50,000-per-QALY threshold. N Engl J Med. 2014;371(9):796–797. Becker R, Doring C, Denecke A, Brosz M. Expectation, satisfaction and clinical outcome of patients after total knee arthroplasty. Knee Surg Sports Traumatol Arthrosc. 2011;19(9):1433–1441. Karlsson J, Sjogren LS, Lohmander LS. Comparison of two hyaluronan drugs and placebo in patients with knee osteoarthritis. A controlled, randomized, double-blind, parallel-design multicentre study. Rheumatology (Oxford). 2002;41(10):1240–1248. Altman RD, Akermark C, Beaulieu AD, Schnitzer T. Efficacy and safety of a single intra-articular injection of non-animal stabilized hyaluronic acid (NASHA) in patients with osteoarthritis of the knee. Osteoarthritis Cartilage. 2004;12(8):642–649. DeCaria JE, Montero-Odasso M, Wolfe D, Chesworth BM, Petrella RJ. The effect of intra-articular hyaluronic acid treatment on gait velocity in older knee osteoarthritis patients: a randomized, controlled study. Arch Gerontol Geriatr. 2012;55(2):310–315. Day R, Brooks P, Conaghan PG, Petersen M; Multicenter Trial Group. A double blind, randomized, multicenter, parallel group study of the effectiveness and tolerance of intraarticular hyaluronan in osteoarthritis of the knee. J Rheumatol. 2004;31(4):775–782. Kiadaliri AA, Englund M. Assessing the external validity of algorithms to estimate EQ-5D-3L from the WOMAC. Health Qual Life Outcomes. 2016;14(1):141. Kurtz S, Ong K, Lau E, Mowat F, Halpern M. Projections of primary and revision hip and knee arthroplasty in the United States from 2005 to 2030. J Bone Joint Surg Am. 2007;89(4):780–785. Kurtz SM, Lau E, Ong K, Zhao K, Kelly M, Bozic KJ. Future young patient demand for primary and revision joint replacement: national projections from 2010 to 2030. Clin Orthop Relat Res. 2009;467(10):2606–2612. Hawker GA, Guan J, Croxford R, et al. A prospective population-based study of the predictors of undergoing total joint arthroplasty. Arthritis Rheum. 2006;54(10):3212–3220. Hawker GA, Wright JG, Badley EM, Coyte PC. Perceptions of, and willingness to consider, total joint arthroplasty in a population-based cohort of individuals with disabling hip and knee arthritis. Arthritis Rheum. 2004;51(4):635–641. Hawker GA, Wright JG, Coyte PC, et al. Determining the need for hip and knee arthroplasty: the role of clinical severity and patients’ preferences. Med Care. 2001;39(3):206–216. Woolf AD, Pfleger B. Burden of major musculoskeletal conditions. Bull World Health Organ. 2003;81(9):646–656. Wolf AD, Pfleger B. Burden of major musculoskeletal conditions. Policy and practice. Special theme-bone and joint decade 2000–2010. Bull World Health Organ. 2003;81(9):646–656. Conaghan PG, D’Agostino MA, Le Bars M, et al. Clinical and ultrasonographic predictors of joint replacement for knee osteoarthritis: results from a large, 3-year, prospective EULAR study. Ann Rheum Dis. 2010;69(4):644–647. Zeni JA Jr, Axe MJ, Snyder-Mackler L. Clinical predictors of elective total joint replacement in persons with end-stage knee osteoarthritis. BMC Musculoskelet Disord. 2010;11:86. Turajane T, Amphansap T, Labpiboonpong V, Maungsiri S. Total knee replacement following repeated cycles of intra-articular sodium hyaluronate (500–730 Kda) in failed conservative treatment of knee osteoarthritis: a 54-month follow-up. J Med Assoc Thai. 2009;92(Suppl 6):S63–S68. Waddell DD, Bricker DC. Total knee replacement delayed with Hylan G-F 20 use in patients with grade IV osteoarthritis. J Manag Care Pharm. 2007;13(2):113–121. Losina E, Paltiel AD, Weinstein AM, et al. Lifetime medical costs of knee osteoarthritis management in the United States: impact of extending indications for total knee arthroplasty. Arthritis Care Res (Hoboken). 2015;67(2):203–215.